This used to be better. Pros: I like the reporting, collections and accounts receivable. Cons: It is expensive and I can go somewhere for cheaper. Pros: We are mostly pretty satisfied with the website. it seems to work well and is easy to use for customers and us. i like the website/ the support. Pros: I have a rep that I am able to keep in contact with regularly & that is very helpful. They have great customer support. Pros: It is very functionable and a great platform. I like that this is easy to use unlike Blackbird. I love their ideas and flexibility for the website. Pros: Easy and smooth to make changes without a lot of issues. Support is good! Brings in lots of leads and sales. Pros: Great website, easy to navigate and very interactive for our customers. Revamping my websites and business. Pros: DS is reliable and does exactly what we need. Support is pretty good. Easy and efficient! Our Sales Guy is always available. Pros: They do a great job for us. Website is a powerful sales tool. Pros: Never a problem with all the sites. Easy to manage. Cons: We have multiple dealerships and feed issues are the biggest problem we have. glitches happen. Like the ease of use. Pros: Good site thast clean. Many options. DealerFire is a custom web design and Internet marketing firm that caters specifically to the automotive industry. DealerFire was founded in 1999 and is located in Oshkosh, Wisconsin. They were acquired by DealerSocket and officially became the Website/Marketing product in 2015. DealerFire currently provides responsive websites to over 1,500 automotive clients (with a growing number of independent dealers) including some of the largest dealer groups in the United States. DealerFire has OEM programs in place with 6 major U.S. auto manufacturers. They also support over 30 Tier 2 OEM dealer advertising group websites that provide a cohesive regional marketing presence for participating dealers. 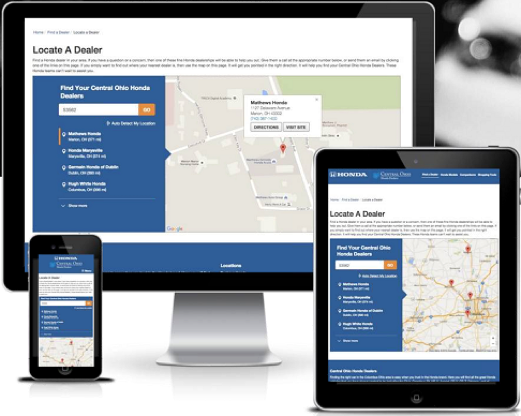 DealerFire was one of the first major providers in the industry (2013) to provide responsive website platforms for dealerships and enterprises groups of all sizes. DealerFire provides digital marketing and brand management best practices and integrates them to develop a personalized approach for every auto dealer website, landing page, micro site, mobile site and marketing campaign. DealerFire draws inspiration by monitoring and staying abreast of design and digital marketing trends across industries and incorporates the latest in website design into their products. This attention to detail translates into automotive websites that not only display content efficiently, but also engage users on a more personal level. Examples of these learning’s and how they are applied in the DealerFire website application are outlined in this section. DealerFire’s responsive websites have the ability to personalize the user experience with relevant dealership information, offers and inventory based on consumer location. This functionality automatically detects the user’s location, or the user can manually type in their ZIP Code. Once the consumer’s location is detected, the entire website experience is tailored with information most relevant to the customer in their present location. This feature is especially relevant to groups and enterprise operations that may have multiple dealerships spread throughout a city or region. Specific configurations are available that will allow multiple dealers to show in a user search based on predefined radius proximity rules. Users have the ability to save vehicles from SRP and Vehicle Display Pages (VDP) to compare specifications such fuel economy, mileage, and other options. In addition, DealerFire’s virtual garage automatically stores all of the vehicles the user has recently viewed while navigating the site. This functionality ensures that vehicles are available to the user even if they forgot to save a specific vehicle of interest. The website provides users with the ability to toggle between the 2 categories (Saved and Recent). DealerFire’s websites are designed with a “consumer dictated experience” as a focal point. The philosophy behind this design methodology is to get the consumer the information they need as quickly as possible. The live search functionality incorporated into the site allows the user to simply type keywords or phrases into the tool and results are automatically returned. Depending on the keyword, results can be vehicle-specific or drive the user to a vehicle with the desired feature. Entering the word “navigation” will return vehicles in inventory with the feature as well as articles and other informational resources related to the keyword. All the keywords entered into the site are tracked in the backend tool (Ignite) and help provide additional insight into SEO optimization strategies. DealerFire websites are designed to be free of clutter and optimized for the detected device. Search Results Pages (SRP) and Vehicle Display Pages (VDP) are designed to present information in a clear and concise fashion minimizing the number of clicks required to navigate to an item. Users have become conditioned to have the ability to scroll instead of clicking on each page. DealerFire provides this functionality on their SRP and VDP pages, allowing users to navigate the website in a familiar manner. Pagination is also provided which enables users the ability to quickly return to an area of interest without the need to scroll through previous results. DealerFire’s vehicle galleries are designed to maximize the viewable size of the image not only by optimizing the image based on detected device, but also based on the size of the image provided. Galleries are designed with no maximum image size restrictions and include the ability to normalize vehicle color and feature descriptions to provide a uniform appearance to the user. DealerFire simplifies vehicle merchandising by providing one-time vehicle incentive entry management. Incentives are manually entered one time based on stock number, vehicle model or trim and are displayed in all relevant areas on the website. This ensures accuracy and speeds the update and maintenance of the site. OEM FTP incentive feeds are in development to provide additional automation. 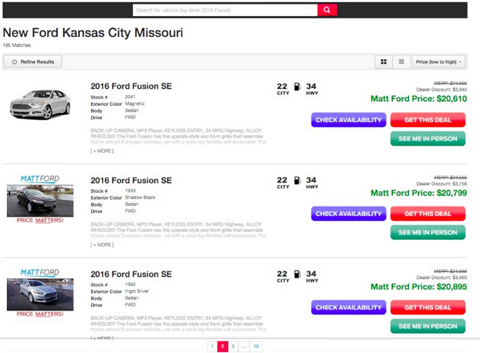 Showroom functionality designed to mimic an OEM website is provided in the DealerFire website to help users who are just beginning the shopping process (high funnel) to engage with the dealership directly. 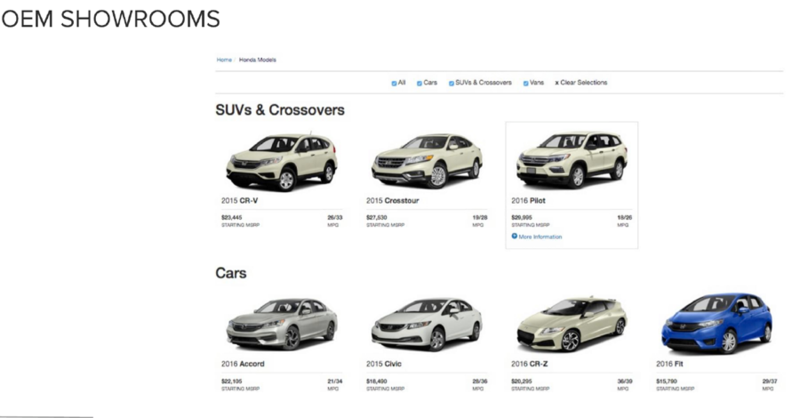 The showrooms display the brands’ models by segment and allow the user to view a model specific landing page or view dealership inventory. All model specific landing page content is written in-house by DealerFire and is original content. This is extremely valuable to the dealership as it helps generate higher SEO results allowing the dealership to standout in the search processes. The DealerFire backend management tool is called Ignite and every website customer has access to this module to update content, view reports and manage inventory. An Account Manger is also assigned to the dealer when the site is activated and plays an integral role in helping the dealer get the most out of the data available in the tool. The Ignite tool is designed in a WYSIWYG (what you see is what you get) fashion utilizing easy to navigate drag-and-drop interfaces that make content updating easy. The website page builder allows the preview of webpages from within the editor. Page/template selection is easy as the tool provides a preview of the page from the drop-down menu, simplifying and speeding the processes. Changes are tracked and time stamped by user and allow for the site to revert to a previous design, if needed. Enterprise/ group management is made easy in Ignite as the tool allows the user to push common setup information and assets across multiple websites with a few clicks. Coupons and Incentives are created with unique start and expiration dates and can be configured down to an exact hour and minute. This allows administrators the ability to create content ahead of time and eliminates the need to manually delete offers upon expiration. The Coupon Builder has a preview function and, as mentioned above, coupons can be pushed across enterprise websites for easy administration. Coupons are also responsive in design and automatically resize/rearrange depending on the device and screen size. Coupons can be configured to email to users for added flexibility. DealerFire integrates with many of the leading inventory providers in the industry such as Inventory+, vAuto and Homenet. A unique feature of the Ignite platform is the availability of a mobile app for inventory updates. The app can be particularly helpful to smaller independent dealers in that it provides picture and VIN capture through the phone camera feature. DealerFire believes in providing reporting that is completely transparent and helps the dealership understand what is and is not working on their sites. DealerFire calls this “Measure What Moves You”. 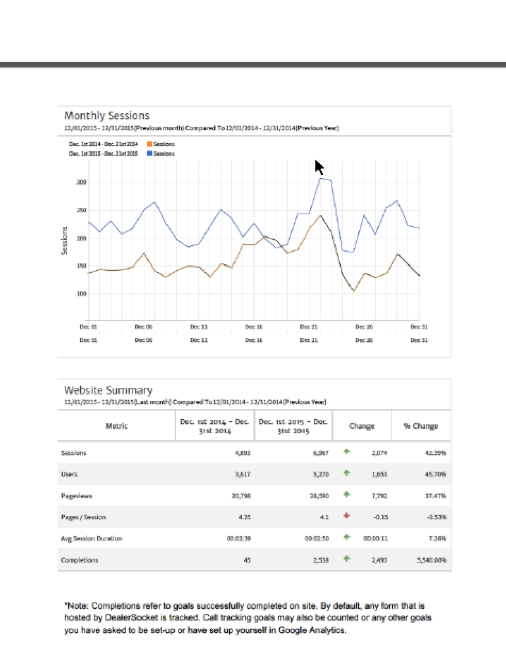 To accomplish this task dealers are provided with not only lead reporting inside Ignite, but also full admin level access to Google Analytics, Live Analytics, and a monthly PDF report (powered by Megalytic) that highlights key site performance metrics. All DealerFire Account Managers are Google Analytics certified and conduct scheduled monthly calls with the dealership to discuss site performance and opportunity areas. 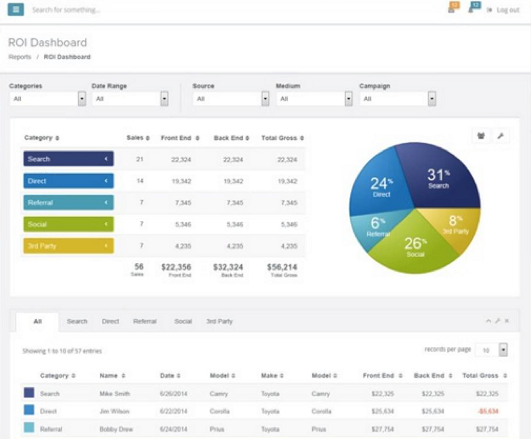 Ignite provides complete lead tracking capabilities by customer. Each customer record highlights leads submitted by type and date along with detailed analytics data that includes: campaign name (if a PPC campaign was used), source (organic/paid), device type, and even operating system. DealerFire’s “Live Analytics” is also available and allows dealer users to track and measure current visitor behavior on the site. Dealership administrators can interact directly with these users by potentially sending a customer a coupon related to an area of the site they are currently visiting. For an additional fee, DealerFire provides sophisticated ROI reporting through the combination of website lead data and DMS data pulled through Authenticom. The ROI Dashboard in conjunction with DealerFire’s Sales Attribution model marries lead and purchase information to demonstrate the complete purchase cycle of a customer. This information not only allows the dealership to track adverting ROI and conversion metrics, but also provides a deeper understanding of gross profit per car line, F&I product penetration and finance type. This data can help drive new marketing campaigns and help the dealership better understand their owner base. DealerFire partners with Optimizely and Clicktale to provide ongoing website testing to continually improve the performance of templates and website features. Dealerships can utilize the optional services to better optimize their sites over time. The DealerFire website platform integrates with the DealerSocket CRM product and provides the ability to tightly coordinate customer communication activities based on website activity. Comprehensive consumer profiles including personal information, website activity and shopping behavior are tied together for use in creating engaging personalized consumer marketing campaigns. DealerFire has their own team of content marketing experts that a dealership can contract to optimize their brands presence on the Internet. Content experts specialize in writing 100% unique content for dealership landing pages, blog posts and vehicle landing pages. Content is developed in a engaging fashion incorporating not only automotive information, but pertinent news facts and cultural information that can add more interest to a piece. DealerFire’s team is highly versed in Google Analytics and content placement ensuring that the dealership appears in the highest possible search position in a given category. Detailed SEO/PPC reporting is included with this option. DealerFire provides a comprehensive team of experienced professionals to guide a dealership or enterprise throughout the installation process. Once a contract is signed, a ‘transfer call’ is conducted that allows the DealerFire Sales Consultant to introduce the Account Manager and team that will be facilitating the installation. The installation team consists of a Developer, Designer, Content Writer and Data Specialist (along with the Account Manager). This team works with the dealership to better understand the desired digital strategy, store history/ brand philosophy, community involvement and any desired or required visual elements (colors or logos). Once all of the information is gathered, an iterative design process begins to ensure that all project specifications are being met. 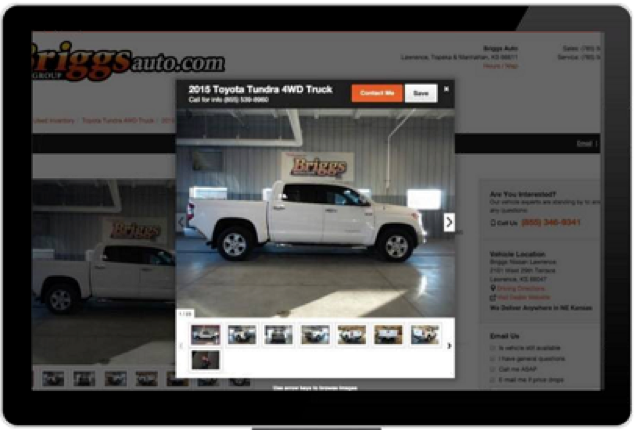 A mock-up of the site is created for dealership approval. The timeline is typically 4 – 6 weeks from the transfer call to site approval, depending on the amount of customization and complexity. Approximately one week before launch, the Account Manager reaches out to the dealership, to train on the the system. DealerFire’s support is designed to provide both proactive and reactive services. DealerFire’s account team monitors website performance (E.G. bounce rates, webpage not found errors) and the Account Manager will proactively communicate any issues as well as conduct monthly performance calls with the dealership. An example of reactive support may include a dealer calling in to request a change to their website. DealerFire does not utilize a traditional call center and the person who answers the call will actually be implementing the change. Dealership personnel have access to the DealerFire portal to check on support ticket updates and learn about recent enhancements to the platform. DealerFire’s typical contract consists of a 12-month term that continues month-to-month after the initial contact period expires. A 30-day notice of cancelation is required when cancelling. Additional term lengths are available and may offer price concessions.